Come school sports day, you'd rather expect the members of its karuta club to hide as far as possible from such activities. Not so Mizusawa's ragtag bunch, who not only participate in an inter-club relay competition but go on to win (albeit rather improbably) in the final. Such is the driven nature of those within the club since their exploits at Omi Jingu, as all of the members on-hand have their own goals - goals that they covet and work towards fiercely despite their odd moments of self-doubt. Nowhere is this better expressed than within Taichi - so driven is he to reach Class A as soon as possible that he breaks up with his girlfriend without a second thought and sneaks off to far-flung karuta tournaments to try his hand and improve his game... not that he's the only one on that count. 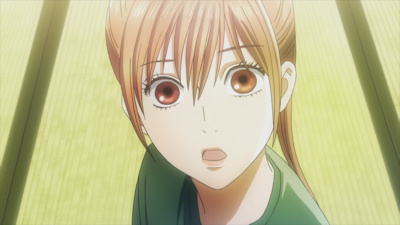 While reaching the top rungs of the karuta ladder aren't as easy as Taichi and Nishida hope, their troubles are relatively transitory compared to those of Chihaya herself. Following her defeat at the hands of eventual karuta queen Shinobu, her focus has been solely upon her speed and reactions in light of that defeat - but is this really the correct approach? Her karuta teacher suggests otherwise, even going as far as to suggest that her speed might well be her downfall - a thought that leaves her confused and bewildered until her fellow club members being to dissect what he might mean and point Ayase down the path towards improving as a player in some entirely different ways. Although this episode meandered hither and thither a little too much, removing some of its more normal pin-point focus as a result, there was still a fair amount to enjoy here, if only in terms of seeing the group we've followed for a little while now working so hard and improved because of it - no full-on special powers or abilities are on show here, just good and honest practice. More notably, Taichi's place in the series becomes ever more fascinating - particularly now that his girlfriend is out of the picture (if she was ever really in it), it's becoming more and more difficult to discern what really drives him - is it love of Chihaya, love of karuta or rivalry with Arata? The answer most likely sits somewhere in-between those three points, but it's an intriguing facet of this fascinating little series that keeps me coming back for more.